Review: Barnabas Collins is a vampire. Two centuries after being buried he is set free. He returns to his ancestral home, Collinwood Manor to find it in ruin. His family needs his protection. Not the best film that Johnny Depp has been in. He can do so much better. Apparently this film is based on a T.V. 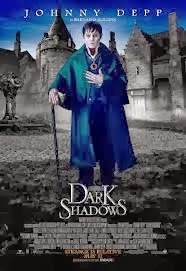 show that was on years ago called Dark Shadows. On some websites for the genre they have put down that it is a comedy. I couldn’t put it down for that only because I didn’t laugh once. The film is all over the place. I don’t think that Tim Burton really knew what he wanted to do with the film. I was waiting all the way through for it to get better and it didn’t. Huge disappointment. One film critic wrote “Johnny Depp once again takes a role where he allows the make up and prosthetics to do the acting for him….”.